Description Of Item: vinyl-roto approach to the line allows for an amazingly accurate translation from 2-D to the three-dimensional action figure world. 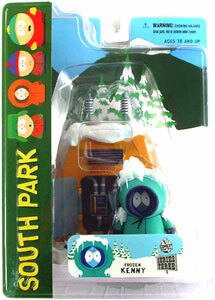 Series 3 includes 6 new highly-anticipated characters: Motorcycle Cop Cartman, Frozen Kenny, Butters, Mr. Mackey and Jesus. Each figure is packaged in a slick clamshell blister.